We’d love your help. Let us know what’s wrong with this preview of When Thou Art Converted by M. Russell Ballard. "Being a Christian, being spiritually born of God, is not a Sunday-only thing," writes Elder M. Russell Ballard of the Quorum of the Twelve Apostles. "Nor is it limited to our service and asociations in The Church of Jesus Christ of Latter-day Saints." In When Thou Art Converted, Elder Ballard shows us that we manifest our belief in Christ and our acceptance of Him as our Savior by the way we live our lives. The most important way we 'stand as witnesses of God at all times, and in all things, and in all places' is in the daily choices we make. These keys of discipleship will bless us and others in the search for happiness and peace--a search that becomes ever more rewarding and fulfilling as we endure to the end with those we love, serving the Savior, who loved us first. 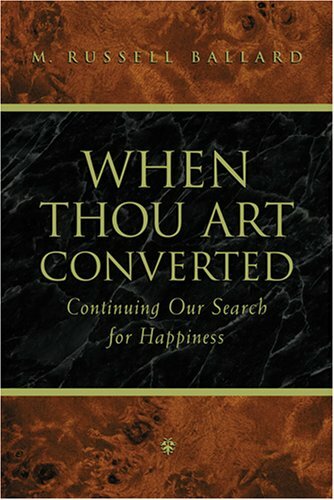 To ask other readers questions about When Thou Art Converted, please sign up. This was a really great book. Nothing too deep that would hurt my brain to read, but just great words and experiences, just an all around good book. I'm just not spiritually ready for this book. This is about doing more, and I'm still working on the basics. didn't finish it. This was a really good book. It is more of a reference book than a sit down and read cover to cover. M. Russell Ballard gives a series of talks (it feels like) on topics dealing with conversion to the Lord, ranging from prayer, service, to women and the priesthood, marriage, and the End of the World. He gently touches on these topics while focusing on the core of Faith in Jesus Christ and what that entails. "One who lays claim to special privilege through the priesthood does not understand the na This was a really good book. It is more of a reference book than a sit down and read cover to cover. M. Russell Ballard gives a series of talks (it feels like) on topics dealing with conversion to the Lord, ranging from prayer, service, to women and the priesthood, marriage, and the End of the World. He gently touches on these topics while focusing on the core of Faith in Jesus Christ and what that entails. "One who lays claim to special privilege through the priesthood does not understand the nature of his authority. Priesthood is about service, not servitude; compassion, not compulsion; caring, not control; stewardship, not turf. Those who would have you think otherwise are operating outside the parameters of their authority." "I believe you cannot watch on film as people are gunned down in cold blood, in living color, and not have it affect the attitudes and thoughts of those who see it. I believe you cannot continually portray human sexuality as just another physical appetite that has to be satisfied - whenever and with whomever (including those of the same gender) the urge strikes - without diminishing respect for God and His commandments. And I believe that the desensitizing effect of such media abuses on the hearts and souls of those who are exposed to them result in a partial fullfilment of the Savior's statement that "because iniquity shall abound, the love of many shall wax cold" (Matt 24:12). "...Please stand for truth and right in your entertainment choices. Some of the things that are being shown in our theaters and broadcast into our homes via television and videos over the Internet are insidious and dangerous. Rather than falling within the scriptural admonition to seek after that which is "virtuous, lovely, or of good report or praiseworthy" (Article of Faith 13), they are more clearly described in Moroni 7, in which the prophet Mormon teaches that "whatsoever thing persuadeth man to do evil, and believe not in Christ, and deny him, and serve not God...is of the devil" (Moroni 7:17)." This book speaks to me. I read it two years ago and started again to prepare for a lesson in RS. This book was written as an continuation of his book, "Our search for happiness," which was originally written for people who were investigating the gospel. This book gives me hope and help. You know how some books seem to be written for you...this one I relate to. I thought this was a good book. It wasn't the standard repeat and rephrasing of scriptural passages (though there was some of that). There was a lot of Elder Ballard's own voice in the writing which made it more enjoyable, easier to relate to and more moving/thought provoking. Glad I read it. Really liked some of Elder Ballards thoughts about "feasting" on the words of Christ, and how he said it's not just enough to read 1 verse a day. Needed that kick in the pants to get me going on really studying my scriptures again. A great book to remind each of us our commitment to live the Gospel of Jesus Christ. Wonderful book. Very easy, fast read. I got this book on my my mission. I loved it then, and I loved it during this second reading. Great book. I love Elder Ballards stories. This was a great book - wonderful stories! Charity, thanks for letting me borrow it! I really enjoyed it. What I enjoyed the most about this book were the stories Elder Ballard tells about teaching his children and grand-children. I always wondered why Peter was so determined to follow the Savior, but then denied him three times. This book gives great insights into that struggle, which a lot of us face. Not as memorable as the first book, but still a good one. Great book on how to become converted. This review has been hidden because it contains spoilers. To view it, click here. I reread this book often. This is an excellent book! It's for members of the church instead of his prior book Our search for happiness for people investigating the church. It was good! Not spectacular. It definitely described some doctrine that I'd been looking for, most of the rest was full of nice explanations and sweet stories. DNF, reading other churchy non-fiction, so i'll come back to it later. One of the best LDS books written. Page 66- We must have personal, spiritual experiences to anchor us. These come through seeking them in the same intense, single-minded way that a hungry person seeks food. If you are feeling a need to learn more about your search for happiness and how to really achieve this goal this book is full of much needed advice in how to do it. I feel that I learned a lot about what I need to do and what I was doing right!